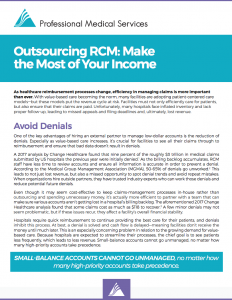 As healthcare reimbursement processes change, efficiency in managing claims is more important than ever. With value-based care becoming the norm, many facilities are adopting patient-centered care models—but these models put the revenue cycle at risk. Facilities must not only efficiently care for patients, but also ensure that their claims are paid. Unfortunately, many hospitals face inflated inventory and lack proper follow-up, leading to missed appeals and filing deadlines and, ultimately, lost revenue.